Well, this was my pick so I had better damn well post. Preacher is absolutely one of my favourite books. I would gladly recommend it to non-comic reading friends. Hell; even my mum loves Preacher. This series opened me up to non-superhero comics. Made me appreciate westerns. Showed me that a scene with two friends talking could be far more powerful than any action sequence. It also showed me that a guy from Ireland could make it in mainstream comics. So; here's to you Preacher, for ruining my life forever! Totally awesome. 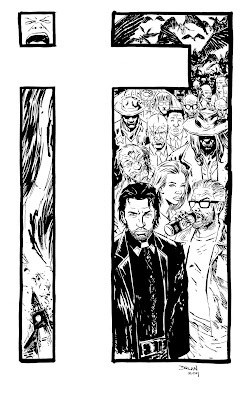 I'm always up for new Preacher art. great piece - love the layout. the design is perfect. my favourite bit is the "baby" in the corner. Good God, Dec! I love this! Great design, and perfect execution! Thanks guys! I spent the week tinkering on the layout in my sketchbook until i was happy with it. Mike; this isn't a patch on your fantastic Cassidy piece. Love what you did. Great design, Declan, and really nice inks. So full of character too. Brilliant job. Your Jesse is *makes A-OK symbol*. I got to agree: this piece is stunning. I echo the sentiment that Preacher opened me up to non-superhero comics. It is also my litmus test for if I'm going to get along with a girl.